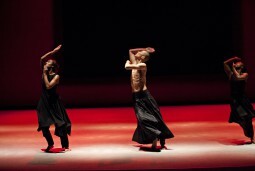 Dance company Akram Khan will bring their Kaash production to Romania’s capital in two representations taking place May 8th and 9th at the Bucharest National Theater. The public will see the new version of the show, which premiered internationally last year. The celebrated initial performance opened in 2002 and merged the world of contemporary dance and that of the Indian classical dance form Kathak. The show features an international cast of five dancers: Kristina Alleyne, Sadé Alleyne, Sung Hoon Kim, Nicola Monaco, Christine Joy Ritter/Sarah Cerneaux. The two representations are part of the Intalnirile JTI (JTI Meetings) series, this year at its 16th edition.